All Web addresses mentioned were functional as of 10-16-15. From the Cumberland Gap to the Atlantic Ocean, this is Virginia Water Radio for the week of October 19, 2015. This week, the sounds of Canada Geese set the stage for an introduction to Goose Creek, a Potomac River tributary that’s long been a defining geographic feature for Loudoun County, Virginia. We start with about 40 seconds of music performed in Goose Creek territory, by the Harrisonburg, Va.-based band The Steel Wheels. Beyond Civil War connections, Goose Creek’s had many roles: it was the site of a canal in the mid-1800s that ultimately failed in competition with railroads; it’s provided the location for two water-supply reservoirs in operation since the 1960s; it’s an important wildlife and recreational resource, having become part of Virginia’s Scenic Rivers Program in 1976; and—east of Leesburg, Loudoun’s county seat—the creek has served since the earliest European settlements as something of a dividing line between different land use patterns in the county’s eastern and western sections. Like many other waterways in many other counties, Goose Creek has helped shape Loudoun County’s environment, history, economy, and culture. Thanks to The Steel Wheels for permission to use this week’s music, and we close with part of another tune from the “Live at Goose Creek” concert: “Walk This Way For Awhile,” to recognize Goose Creek’s many roles in movement and change by water, wildlife, and people. “Riverside” and “Walk This Way For Awhile” are both from the album “Live at Goose Creek,” recorded October 10, 2014, at Franklin Park Performing Arts Center, Purcellville, Va., and produced by Goose Creek Productions; used with permission of The Steel Wheels. The Steel Wheels have a number of songs with Virginia themes and water imagery, and a water-based bird—the Red-winged Blackbird—ends its name to the band’s annual Red Wing Roots Music Festival in Natural Chimneys State Park in Augusta County, Va. More information about The Steel Wheels is available online at http://www.thesteelwheels.com/. More information about Goose Creek Productions is available online at http://www.goosecreekmusic.com/. More information about the Franklin Park Arts Center is available online at http://www.franklinparkartscenter.org/. Goose Creek at Markham, Va., (Fauquier County), July 22, 2012. The creek’s headwaters begin along the Blue Ridge in Fauquier and Loudoun counties. Goose Creek at Evergreen Mill Road south of Leesburg, Va. (Loudoun County), March 21, 2010. The Goose Creek Canal of the 1850s ended at the mill near this location at that time (known then as Ball’s Mill). Flooding Goose Creek along U.S. Route 15 south of Leesburg, Va., (Loudoun County), May 12, 2008. Note the State Scenic River sign. 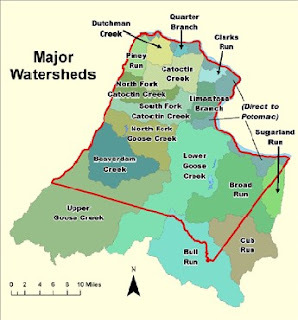 Major watersheds of Loudoun County, Virginia, showing the lower Goose Creek watershed to the creek’s confluence with the Potomac River. Map by the County of Loudoun, accessed online at http://www.loudoun.gov/index.aspx?NID=1512. On Scenic River status: Forty-eight miles of Goose Creek—from the confluence of its north and south prongs near Linden (in Fauquier County) to its confluence with the Potomac River—are designated as a State Scenic River, first designated in 1976 and last extended in 2007. It was Virginia’s fourth designated Scenic River, preceded by the Falls of the James in 1972 and sections of the Rivanna and Staunton rivers in 1975. As of May 2015, 27 Virginia rivers or streams had one or more sections designated. Source: From the Virginia Department of Conservation and Recreation, “Scenic Rivers Program,” online at http://www.dcr.virginia.gov/recreational_planning/srmain.shtml. On settlements: Loudoun County’s first Quaker settlement was established in 1742 by Jacob Janney and was called The Quaker Settlement at Goose Creek; it was later named Lincoln in honor of the president. During its earliest European settlement, Loudoun had two basic settlement trends: one from the east by “sons of plantation owners who established large tobacco plantations in the County similar to those established by their fathers in Tidewater Virginia”; and one from the west of Quakers, Germans, Irish from Pennsylvania, New Jersey, and Maryland, “...famers, merchants, tradesmen, and millers owning smaller tracts of land varying from 40 to a few hundred acres.” In the 1970s, as eastern Loudoun began to experience dense residential and commercial development, western Loudoun continued to consist primarily of small towns, rural housing, and agricultural areas. During that period, Goose Creek east of Loudoun was somewhat of a symbolic border between eastern and western Loudoun. Eventually denser development come to many of the parts of Loudoun west of Goose Creek, too. Sources: Virginia Commission on Outdoor Recreation, “Goose Creek: A Report to the Governor and General Assembly/An Element of the Virginia Outdoors Plan,” December 1975, p. 7; and personal observations by Virginia Water Radio host Alan Raflo, a Leesburg, Va., native. On water supply: In 1961, the City of Fairfax completed construction of a water-supply reservoir on Goose Creek. A Virginia Superme Court ruling prevented Loudoun County from blocking construction. In 1972, Fairfax City completed construction of the Beaverdam Creek Reservoir, on a tributary to Goose Creek. After construction of the Goose Creek system, the Fairfax provided drinking water to customers in Loudon County and the Town of Leesburg, as well as to customers adjacent to the city boundaries. In 2014, Loudoun Water purchased the Goose Creek Reservoir, Beaverdam Creek Reservoir, and other infrastructure from Fairfax City. Source: VirginiaPlaces.org, “Drinking Water for the City of Fairfax,” online at http://www.virginiaplaces.org/watersheds/fairfaxwater.html. Goose Creek Music and Entertainment LLC, “Goose Creek Music announces The Steel Wheels live at the Franklin Park Performing and Visual Arts Center in Purcellville, VA, on Thursday, October 14, 2010 at 8 p.m.” (Oct. 1, 2010, news release), online at http://www.newswire.com/the-steel-wheels-at-goose-creek/63624; and main Web site at http://www.goosecreekmusic.com/. History of Loudoun County Web site, online at http://www.loudounhistory.org/index.html; particularly “Goose Creek Canal—An Ill-fated Project,” “Indians Left the Mark in Naming Landmarks in Loudoun County;” and “Underground Railroad—Journey to Freedom was Risky for Slaves and Guides,” all by Eugene Scheel, Waterford, Va.
Leesburg Today, Loudoun Water Purchases Beaverdam, Goose Creek Reservoirs, 2/3/14. Leesburg Today, Welcome To Loudoun: County's Growth Rate Leads State, Second In Nation, 3/27/14. Loudoun County Government, “About Loudoun,” online at http://www.loudoun.gov/index.aspx?NID=8; and “Water and Hydrology,” online at http://www.loudoun.gov/index.aspx?NID=1363. National Park Service, “Potomac Heritage National Scenic Trail/Underground Railroad,” online (as PDF) at http://www.nps.gov/pohe/learn/historyculture/upload/PHT-Underground-Railroad-pp-1-2-2004.pdf. Virginia Commission on Outdoor Recreation, “Goose Creek: A Report to the Governor and General Assembly/An Element of the Virginia Outdoors Plan,” December 1975. Virginia Department of Conservation and Recreation, “Scenic Rivers Program,” online at http://www.dcr.virginia.gov/recreational_planning/srmain.shtml. A list of the rivers is available in the PDF document at this link: http://www.dcr.virginia.gov/recreational-planning/document/srlist.pdf. VirginiaPlaces.org, “Drinking Water for the City of Fairfax,” online at http://www.virginiaplaces.org/watersheds/fairfaxwater.html. William E. Trout, III, Goose Creek Scenic River Atlas, Virginia Canals and Navigation Society, http://www.vacanals.org/. U.S. Environmental Protection Agency (EPA), “Surf Your Watershed,” online at http://cfpub.epa.gov/surf/locate/index.cfm. This site allows users to locate watersheds and watershed information across the United States. For other episodes on water-related geographic features in Virginia, please see the “Rivers, Streams, and Other Surface Water” category” category at the Index link above (http://www.virginiawaterradio.org/p/index.html). ES.8 - influences by geologic processes and the activities of humans on freshwater resources, including groundwater and major watershed systems in Virginia. VU.7 - knowledge of the Civil War and Reconstruction Era.